A URL, informally termed a web address, also known as Uniform Resource Locator is a reference to a web resource that specifies its location on a computer network and a mechanism for retrieving it. URLs are most commonly used to reference web pages (http). Hypertext Transfer Protocol. A URL in the form http://www.example.com/subfolder/page.html, has several parts & they are explained below. top-level domain in the domain name www.example.com, the top-level domain is “com“. Also known as domain name extension (ie, .com is the extension) also known as suffix. 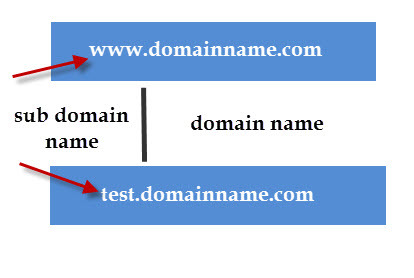 A sub-domain is a domain that is part of a larger domain name in DNS hierarchy. 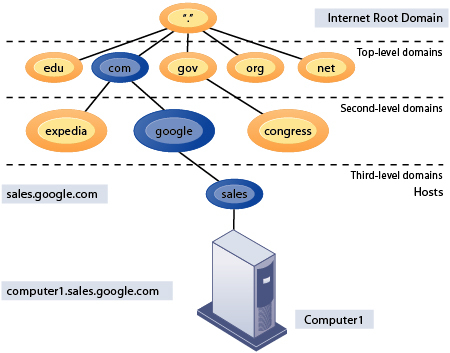 DNS hierarchy consists of the root-level domain at the top, underneath which are the top-level domains, followed by second-level domains and finally subdomains. sub-domains. For example, in the domain name webopedia.internet.com, “webopedia” is a sub-domain of the larger second-level domain “internet”. A second-level domain (SLD) is the portion of the domain name that is located immediately to the left of the dot. Domain names are used in URLs to identify particular Web pages. For example, in the URL http://www.pcwebopedia.com/index.html, the domain name is pcwebopedia.com. While index.html is a particular page (or html file) in the website. For diagram above, the bottom level or third level domain for sales.google.com, sales would be a sub-domain of google.com. Root domain would be google.com. 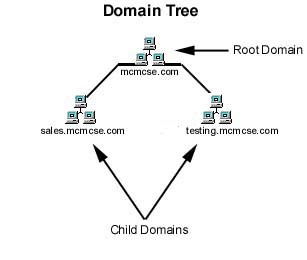 The child domains below are also considered sub-domains. Also, see another post for more on sub-domains.